FORMER Taoiseach Brian Cowen did not believe the sceptics who warned the economy was in danger of collapsing and he had no plans in place for a 'worst-case' scenario. In his first full interview since leaving public life, he stood over the controversial decision to guarantee all the assets and liabilities of the banks in September 2008. He also insisted that he was not expecting to get the job of Taoiseach and said it was a pity that his political career ended the way it did. But Mr Cowen said the Government had not foreseen the collapse in the economy and did not believe the minority of people who were warning of danger at the time. "Well, the truth is that we didn't believe it. We thought the economy would have a soft landing, that economic growth would continue and we could pay for it through the growth that was to come," he said. In his interview in Irish with TG4's 'Comhra' programme – which is due to be broadcast next month – Mr Cowen does not apologise for his actions in government. But he said it was "very regrettable" that people were now carrying a huge burden as a consequence of the crisis. "I would like to say because it's important to do so, and I've said this before, I have a serious duty to accept my responsibility for what happened and I'm doing that. A lot of people are in trouble and they've got mortgages to repay and so on," he said. Mr Cowen did not seek re-election in Laois-Offaly after stepping down as Taoiseach and is currently on a TD's and ministerial pension worth over €130,000 – even after the latest cuts in the Haddington Road agreement. He stood over his Government's decision to introduce the State bank guarantee. "You see, what was happening at that time was that billions of euro were leaving the country. So we had to stop that and get that money back into the country if possible," said Mr Cowen. However, while the bank guarantee halted the flow of funds out of Irish banks temporarily, it ultimately left the taxpayer with a bill of €64bn due to the scale of the losses on the banks' property loans. Mr Cowen said that after the guarantee "other things started to happen, which we hadn't foreseen". The decision is set to be examined by the forthcoming Dail banking inquiry and Mr Cowen has already pledged his full co-operation. 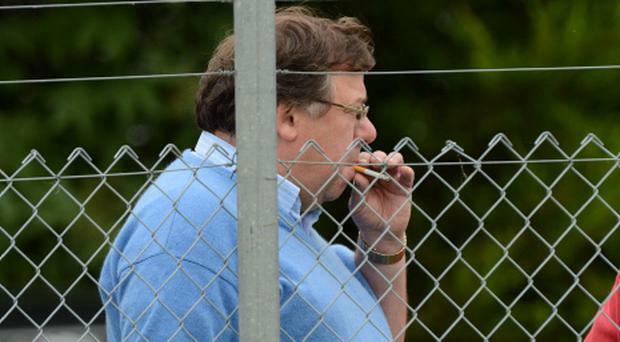 Since leaving office, he has maintained a low public profile, although he's regularly attended Offaly GAA matches. He has been seen at funerals of friends, such as the late Paidi O Se. He also attended the recent Council of State meeting, alongwith other former Taoisigh, to advise President Michael D Higgins on the constitutionality of the abortion legislation. Mr Cowen was asked by TG4's 'Comhra' presenter Mairtin Tom Sheainin about people saying it was his Government that had driven the country to the state it is in now. Mr Cowen said that people had definitely blamed his Government and had shown a huge desire to install a new Government at the last election. He said he accepted his responsibility for what happened but attacked the opposition parties for "rewriting history". "We wanted to improve services such as education, health, social welfare, old age pension and so on. That was our motivation and at the time, the money was there to do that. "And the opposition were telling us we should have been doing more. Whereas now, they're saying that we spent too much," he said. Mr Cowen, who was the first Offaly person to be appointed a cabinet minister, spoke about taking over from his predecessor Bertie Ahern as Taoiseach in May 2008. His description of the event portrays him as a "reluctant Taoiseach". "I wasn't expecting it. What happened was that Bertie decided to step down and nobody else was seeking the position," he said. Mr Cowen said that when some of his colleagues asked him if he would like the job, he said: "Fair enough, I'll go for it." One of Mr Cowen's lowest points in office came after he was accused by Fine Gael's Simon Coveney of sounding "half-way between drunk and hungover" during a 'Morning Ireland' interview after a Fianna Fail get-together in Galway in 2010. He complains about the critical coverage during his time in office on his family, although he insists that he is not angry about it. "Well, I'm a politician and I know what it's like when the atmosphere turns sour like that. "But having said that, at times things were said and written that went too far. They were too personal. There was no need for that." During his time in office, Mr Cowen was constantly urged by backbenchers and advisers to display a more personal side to counter the 'BIFFO' (Big Ignorant Fellow From Offaly) image of him in the media. "There is an image of me out there that isn't very good. Maybe I didn't place enough emphasis on that sort of thing," he said. However, he said that the most important thing to him in any of the positions he had held was "to be myself". "I've never wanted to pretend to be someone else. Every single day of my public life, my approach has always been, 'What is best for the country here?' I may not have been right all the time. "Clearly, nobody could be right all of the time. But we did our best and we were aware at that time that it wouldn't be easy to get re-elected after the next election."